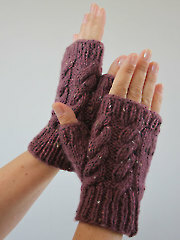 This week designer Rohn Strong joins Deborah Norville with not one but two pairs of fingerless gloves...one knit and one crochet. 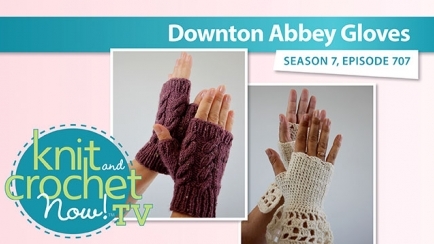 The knit Unger Mitts feature a cable and the Riviera Crochet Mitts has an elegant filet cuff, both of which would be suitable for a dinner party at Downton Abbey! 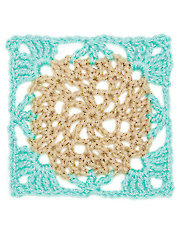 In the stitch corner Ellen is demonstrating a Crochet Motif. I love Debora She is a wonderful host. She makes me want to knit and crochet everything on the show. I'm always excited for what is next. Please bring her back. Love you Debora. I LOVE Debra Norvell! all the projects are wonderfully explained, and I cant wait for the next one! Deborah Norville is such a natural as the host. I like how she compliments the other members of the show, and she's genuine too, she's not just making idle conversation. I'm a crocheter and I love the lacy, fingerless gloves Rohn Strong designed, I'm definitely going to make them for Christmas gifts!